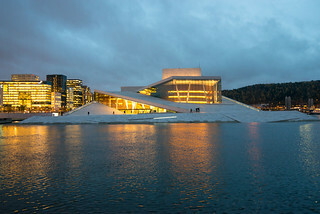 The Oslo Opera House (Norwegian: Operahuset) is the home of The Norwegian National Opera and Ballet, and the national opera theatre in Norway. The building is situated in the Bjørvika neighborhood of central Oslo, at the head of the Oslofjord. It is operated by Statsbygg, the government agency which manages property for the Norwegian government. The structure contains 1,100 rooms in a total area of 38,500 m2 (414,000 sq ft). The main auditorium seats 1,364 and two other performance spaces can seat 200 and 400. The main stage is 16 m (52 ft) wide and 40 m (130 ft) deep. The angled exterior surfaces of the building are covered with Italian marble and white granite and make it appear to rise from the water. It is the largest cultural building constructed in Norway since Nidarosdomen was completed circa 1300. The roof of the building angles to ground level, creating a large plaza that invites pedestrians to walk up and enjoy the panoramic views of Oslo. While much of the building is covered in white granite and La Facciata, a white Italian carrara marble, the stage tower is clad in white aluminum, in a design by Løvaas & Wagle that evokes old weaving patterns.